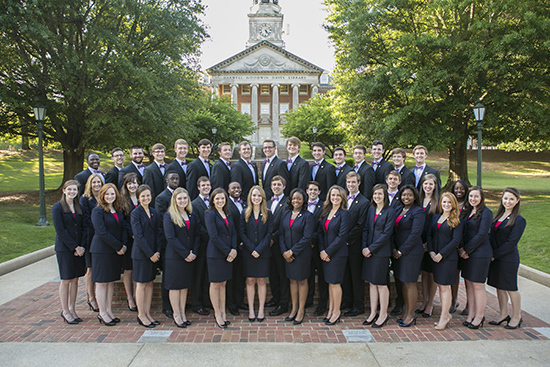 Samford University has selected 14 new Samford Ambassadors for the 2015-2016 academic year. They join 19 returning Ambassadors. To be considered for the position, candidates must demonstrate excellent communication skills, proven leadership ability, enthusiasm for Samford, maturity, sound judgment, a positive personality and reliability, according to Molly McGuire, director of alumni programs and Ambassador advisor. Candidates are recommended by a Samford employee or current ambassador and are selected after a series of interviews. This year, 144 students were nominated for the 14 positions. The ambassadors assist Samford’s administration with donor, constituent and community relations, act as liaisons between Samford and its many constituents, and serve as hosts at events on and off campus. Wesley Walters, freshman biology and premedicine major from Watkinsville, Georgia. Jay Davis, a sophomore business major from San Marino, California, is the 2015-16 Samford Ambassador president. Caitlin Campbell, a first-year pharmacy student from Clarksville, Tennessee, is vice-president, and Anna Pinter a junior, interior architecture major from Wallkill, New York, is secretary. All three officers have been Samford Ambassadors since 2014. Bailey Fuqua is a news and feature writer in the Office of Marketing and Communication.